James Kennedy » Outdoor Dome of Doom on October 16! Outdoor Dome of Doom on October 16! Remember summer? On August 22, Collaboraction and I threw an outdoor Order of Odd-Fish Dome of Doom costumed dance party in Chicago’s Logan Square. We’re going to do it again, on October 16—details below! Here’s a video of what happened. Check out the adorable dancing children! The nascent breakdancers! The, uh, guy who kept throwing his infant daughter in the air, scaring the crap out of me? It was like our Odd-Fish fan art show and dance party back in April—but outdoors this time, anyone wandering by could get involved. And they did! You can feel the happy vibe in the video. My partners-in-crime at Collaboraction and Environmental Encroachment deserve a hand for this. It was all made possible through the Richard J. Dreihaus Foundation and the Chicago Park District. It went so well, we’ve decided to do it again! The Dome will be set up right next to the eye! 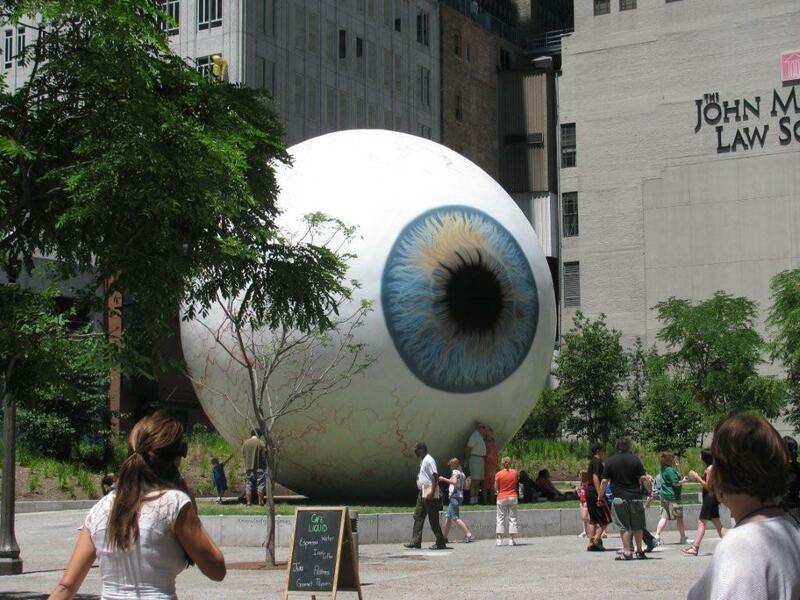 I hope Rahm Emmanuel shows up at the Dome of Doom and gets in a staring contest with the eyeball. I think it will blink. For music, Jayve Montgomery of the Chicago Park District’s “Inferno Mobile Recording Studio” will be on hand with something called Sound Beams. I’m told that “the Sound Beams can be placed so that while the kids dance they will trigger the beams and make music.” So the music will actually be controlled by the movements of the kids in the Dome? Awesome! Two dancers enter. One dancer leaves! This wacky, fun, interactive outdoor spectacle is a blast for the whole family. It’s also a reenactment of the climactic scene from The Order of Odd-Fish! Signed copies will be available on site for purchase. It’ll be a hoot. If you live in Chicago, please do come.